Arvato Systems and Vidispine Present Joint Product Innovations at NAB in Las Vegas | Arvato Systems | IT Strategy. Solutions. Innovation. New York, April 5, 2018	(Newswire.com) - ​Gütersloh/Cologne/Las Vegas – With around 103,000 visitors from 166 countries and over 1,700 exhibitors, NAB is arguably the largest media, entertainment and technology event in the world. 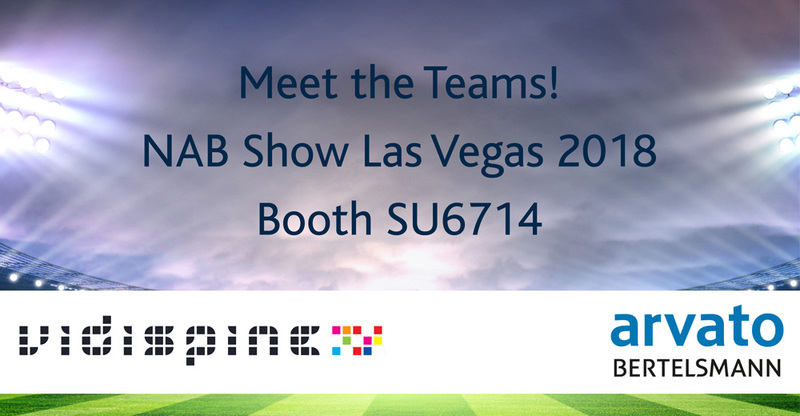 In keeping with the motto "Connecting Content & People", from April 9-12 2018, Arvato Systems and Vidispine AB will, for the first time, jointly present their video editing solutions at their NAB stand in Las Vegas. Vidispine has been part of the Arvato Systems Group since November 1, 2017. A special highlight this year will be the launch of the on-demand SaaS version of VPMS EditMate, an award-winning production asset management system (PAM) for Adobe® Premiere® Pro CC. Affordable and scalable monthly subscriptions to the service will be available from spring this year, along with the ability to add additional media management features. An embedded streaming server from Arvato Systems gives visitors an insight into how EditMate enables editors to work from anywhere, while reducing product usage and infrastructure costs. Visitors to Arvato Systems' booth at NAB will receive an exclusive expert demo of the solution and can register directly for a free trial of "EditMate" SaaS. Built on the most flexible data model and object repository in the market, VPMS Platform combines state-of-the-art technology with decades of experience in enterprise media management to provide content management and workflow orchestration that mirrors business requirements and reduces integration overhead. At the Arvato Systems’ booth at NAB 2018, experts will be demonstrating how users can configure and customize VPMS Platform to suit any environment, without the need for bespoke development. Utilizing concepts from other industries, the rights management and scheduling solutions in BMS Avatega enable broadcasters to minimize the average unit cost of programming while maximizing revenue. Applying a programmatic approach, Avatega offers significant efficiency gains by automating scheduling tasks for linear and catch-up services while also increasing rights utilization. NAB 2018 will see the launch of Vidispine API as-a-Service as part of Vidinet, Vidispine's cloud-based media services platform with global scalability. It is the same full-featured API; on tap and managed by the Vidispine operations team. With Vidispine API as-a-Service users can start small and scale up as needed within a predictable cost structure. Vidispine will also release a toolkit for fast-tracking application development, as well as new services added to the ever-growing Vidinet platform. Be sure to visit us at the NAB. Representatives from Arvato Systems and Vidispine will be available at booth SU6714 to assist further.